Roadrunners are actually two species of bird which are members of the cuckoo family. Their feathers are brown/black and white. Roadrunners are thought to be monogamous birds, it's mean the male and female mate with each other for life. They are large, slender birds with long legs and very large bills. Their feet have two toes in front and two toes in back. Roadrunner have a distinctive head crest. Their call is a dove like coo. Roadrunners are found in the desert areas of the Southwestern United States, Mexico and Central America. Roadrunners eat insects, scorpions, lizards, snakes, rodents and other birds. They also eat plants and fruit. Roadrunners are omnivorous animals. Roadrunners live in the shrub brush areas of deserts. Roadrunner is the state bird of New Mexico. Roadrunners can run up to seventeen miles an hour and prefer running to flying. 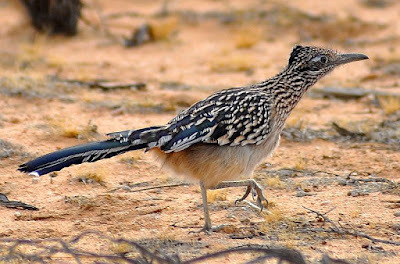 The Roadrunner may produce two clutches a year. This is more common in rainy years. Because they can move so quickly, roadrunners are one of the few animals that hunt rattlesnakes. Roadrunners enjoy perching high in trees to sunbathe. A Roadrunner nest is made of anything the male can find such as sticks, snakeskin, and leaves. It is commonly placed 1–3 meters above ground level.